The prize is, in effect, a recognition not just of Dylan himself but of the fact that some of the best writing — bar none — in recent decades has come in the form of music lyrics. Dylan, who becomes the first American since Toni Morrison (1993) to win the prize, joins an elite group of writers including William Faulkner, Gabriel Garcia Marquez, and T.S. Eliot. Another Minnesotan, Sinclair Lewis, won the prize in 1930. The award carries a monetary prize of approximately $900,000, and will be awarded in a ceremony on Dec. 10. It recognizes Dylan's entire lifetime of work, which has been a significant influence on virtually every songwriter since the early 1960s. Dylan has long been mentioned as a dark-horse candidate for the prize — if any rocker was going to take it, it would be him. Dylan is now between weekends of the Desert Trip music festival in Indio, Ca., where he's scheduled to play tomorrow night with the Rolling Stones. He also has a series of dates on his "Neverending Tour" booked through the fall — though, fortunately, he's free in the month of December. Bobby Zimmerman was born in Duluth, Minn. on May 24, 1941. When the boy who would become Bob Dylan was six, his family moved to the Iron Range town of Hibbing to be closer to the family of his mother, who was sick with polio. Dylan would spend the rest of his childhood and youth in Hibbing, a small city that's still grappling with its newfound role as a music mecca. From the beginning, Bobby's interest in music was apparent — as was his ambition to become a unique brand of star. Though he was surrounded by the American songbook standards he's lately taken to singing, he also listened to distant broadcasts of R&B, following the rapid evolution of early rock and roll. By the time he was a teenager, he was playing local gigs, even playing a couple of shows with the young Fargo star Bobby Vee — who had to let Bobby Zimmerman go essentially because it was too hard to haul a piano around. The Hibbing High School Auditorium is now considered a Dylan landmark, as the site of a talent show he played with his band the Golden Chords. It's never been definitively established exactly what byway Dylan had in mind — if, indeed, any literal street at all — when he wrote his bitter 1965 song "Positively 4th Street," but he did spend a brief, influential period of his life traipsing along 4th Street SE in Minneapolis. That street passes through Dinkytown, where Dylan lived, in an apartment above what's now the Loring Pasta Bar, when he attended the University of Minnesota from 1959 to 1960. In Dinkytown, Dylan developed his persona as an itinerant folkie. Among his mentors were "Spider John" Koerner, Tony Glover, and Dave Ray; their 1963 album Blues Rags and Hollers would become an important document of what's now called the "folk revival" in American music. It was in Minneapolis that Bobby Zimmerman became "Bob Dylan," borrowing a surname from the poet Dylan Thomas and a philosophy from Woody Guthrie, the activist singer-songwriter who used folk tropes to address present-day topics. Dropping out of college and grabbing a guitar, Dylan headed east in 1961 to see a dying Guthrie in the hospital, a moment that's been widely seen as the passing of a musical torch. 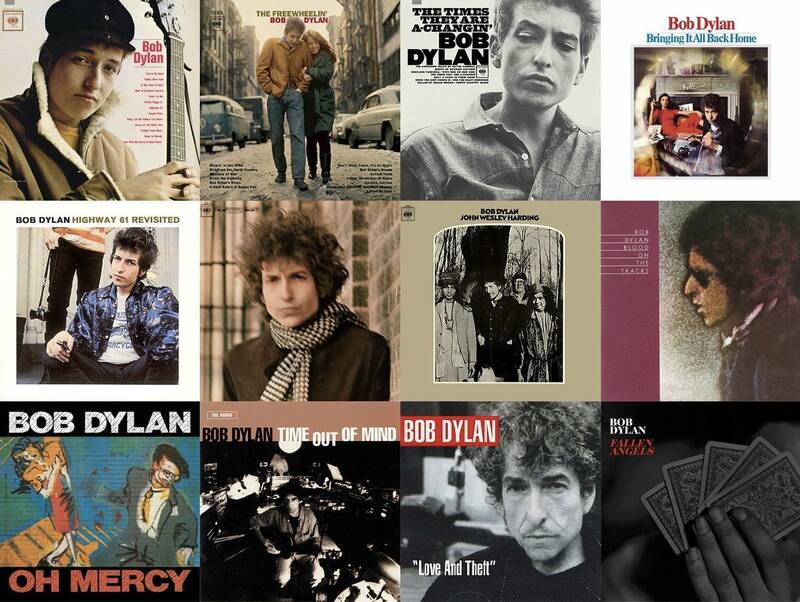 Dylan rapidly became a fixture on the Greenwich Village folk scene, and he also shuttled over to Harvard Square — which gets a shout-out on his first album, 1962's self-titled collection. The Cambridge folk scene was much more academic than the New York scene, but it was out of Cambridge that the folk revival's first big star came — a woman who was to play a major role in Bob Dylan's career and life. Joan Baez, a professor's daughter who immediately became a magnet in the Harvard Square coffee shops with her bell-like voice and her striking beauty, had a commercial hit with her self-titled 1960 album and became a major national draw. She immediately recognized Dylan's gift and brought him on tour with her, telling her audiences that he was a talent to watch. The two also developed a personal relationship that became increasingly fraught as Dylan's star rose. His records and shows were making ripples, but it was Peter, Paul & Mary's hit version of his "Blowin' in the Wind" that convinced a wide audience of Dylan's songwriting gifts. Unlike anyone else, Dylan could write songs that combined timeliness, universality, poetry, and melodic brilliance; "The Times They Are A-Changin'" sounded like a clarion call to people young and old who wanted to overthrow the established way of doing things. That meant the growing war in Vietnam, of course (see: "With God on Their Side," a song Dylan and Baez often sang as a duet), but it also meant Civil Rights. Dylan, Baez, and other folksingers joined the Civil Rights struggle, and Dylan was among those who sang at the 1963 March on Washington. Like elder statesman Pete Seeger, Dylan had become an icon of the progressive movement. That's why it seemed like such a sell-out when Dylan — with Seeger himself threatening to cut the power backstage — "went electric" at the Newport Folk Festival. The short set has become one of the most iconic moments in rock history. Popular history has the crowd of folkie purists booing a wounded Dylan off the stage; the reality was much more complex, but the electric set certainly accelerated Dylan's growing disenchantment with the folk scene, and signaled unambiguously that he was shooting for something even bigger than what he'd become. At Newport, Dylan played songs from his new album Bringing it All Back Home. Along with Highway 61 Revisited (1965) and Blonde on Blonde (1966), the album was part of one of the most remarkable creative runs not just in rock history, but in art history. With those three albums, Dylan took everything that had come before — blues, folk, rock, country — and smelted something both old and new, music that contained multitudes. Here were rock songs that contained scathing introspective poetry, loping folk-country numbers that told elliptical relationship stories, ballads that made searing indictments of something or someone that seemed forever to be just outside the listener's grasp. The albums set a new bar for popular music, and every major artist — from London to L.A. to Motown — immediately understood that. Pivotal albums from the Beatles, the Rolling Stones, the Beach Boys, and countless other '60s artists reflect Dylan's powerful influence. Dylan himself, meanwhile, was running off the rails. A 1966 motorcycle accident gave him the excuse to slow down, to seclude himself at his home in upstate New York and simply breathe. He would never again be the world-changing musical force he had been for those few meteoric years, but for the next half-century, he would continue to write and record songs, building up a discography of stunning breadth and depth. The first music to emerge from Dylan's seclusion was the spare, hallucinatory John Wesley Harding (1967). (With the Band, Dylan had also recorded the songs that would be released several years later as The Basement Tapes.) That was followed by yet another right turn: towards straightforward country music, in an album (Nashville Skyline, 1969) featuring a duet with Johnny Cash. The early 1970s saw a string of releases that left fans alternately impressed and bewildered. Self Portrait (1970) included lushly orchestrated covers, confounding listeners who wondered what the greatest songwriter in American history was doing singing syrupy versions of numbers penned by others. New Morning (1970) — a collection built around songs written for an abandoned stage musical — was a relatively minor effort that nonetheless felt like a relief, just because it was listenable. Dylan still had at least two major comebacks left in him, though. The first came in 1975, with Blood on the Tracks — a breakup album, recorded partly in Minneapolis, that had Dylan at his most forthrightly impassioned since his early protest songs. That was followed by Desire (1976), a richly musical album that featured the topical story-songs "Hurricane" and "Joey." He went back on the road, too — bringing Baez and others along on a "Rolling Thunder Revue" that combined new material with challenging reinterpretations of old songs. Having redefined himself several times already, Dylan was about to make the most radical move of his career. With Slow Train Coming, Dylan — raised as a Jew, though he was never particularly observant — brought his newly born-again Christian status into his music. Recorded with the Muscle Shoals band, the slick Slow Train Coming (1979) is the best-regarded of a "Christian trilogy" that continued with Saved (1980) and Shot of Love (1981). Some believers embraced the new Dylan and some were confounded; it took decades for Dylan's gospel songs to be properly reevaluated. There's no decade of Dylan's career that's been subject to such hot debate as the 1980s. Leaving gospel behind, Dylan relaxed into his status as a rock god — relaxed too far, many thought. Albums like Infidels (1983) and Empire Burlesque (1985) got mixed reviews, and then Dylan's musical inspiration bottomed out so decisively that his mid-80s slump (the 1986 album title Knocked Out Loaded, it was speculated, referred to the way in which it was made) featured in the pre-concert career narrative that introduced many of Dylan's shows a couple of decades later. The way out of the slump glimmered in Oh Mercy (1989), an album recorded with producer Daniel Lanois in New Orleans. The strong, swampy cuts on that album positioned Dylan as a croaky-voiced wanderer who drifted through post-apocalyptic musical landscapes. That persona wouldn't come into full force, though, for a few more years. Oh Mercy was followed by a sort of intermission in Dylan's career. The star-studded, aimlessly rocking Under the Red Sky (1990) brought the '80s to a thudding conclusion, but then Dylan busted out with the fascinating Bootleg Series, Vols. 1-3 (1991). In addition to constituting the first official release of many crucial rarities and live tracks from the '60s and '70s, that initial bootleg set shone a new light on Dylan in the '80s — an artist who released "Union Sundown" but declined to share "Blind Willie McTell," a man who released his best album in a dozen years (Oh Mercy) but left its strongest song ("Series of Dreams") out of the final mix. Dylan remained pop music's most perplexing enigma. Taking the stage alone at the end of a 1992 Madison Square Garden tribute concert celebrating his 30-year recording career, Dylan chose to play a few songs including "Song to Woody" (one of the two originals on his debut album) and the brilliant but starkly despairing "It's Alright Ma (I'm Only Bleeding)," putting an abrupt end to the evening's celebratory atmosphere. Dylan remained solo and acoustic for Good As I Been To You (1992) and World Gone Wrong (1993), two albums in which he covered well-weathered folk songs. In 1997, Dylan returned to original music with Time Out of Mind, his second great comeback. With Lanois again at the helm, Time Out of Mind brought the aging Dylan out at full force; ranging from the atmospheric "Love Sick" to the sweet "To Make You Feel My Love" to the epic "Highlands," the album felt like Dylan's first major statement in over two decades and won a Grammy for Best Album. It was followed by Love and Theft (2001), a second consecutive late-career classic that many fans think is even better. Dylan by this point was over a decade into his "Neverending Tour," leading his crack band increasingly from the keyboard and creating near-orchestral arrangements for sardonic rockers and wistful ballads. Modern Times (2006) concluded a remarkable run of new music. Meanwhile, Dylan started his memoirs with the acclaimed Chronicles: Volume One (2004), a non-chronological memoir that was lauded as one of the best books of its kind ever written. We're still waiting for volume two. For a man who inspires museum shows and even entire museums, Bob Dylan isn't hard to find. You just have to meet him on his own terms: playing a theater or a casino near you. He continues to tour constantly, and to put out new music such as this year's Fallen Angels, though it rarely attracts as much buzz as reissues in his burgeoning Bootleg Series. Here's a man who's been so many things to so many people over the course of his 60-year music career. He's been singing like an old man since he was a teenager. He's been Zimmy, he's been Bobby, he's been Lucky. Right now, though — at the ripe age of 75 — Bob Dylan seems to want nothing more than just to be himself. Ultimately, that's what keeps this towering music icon forever young. Portions of this article were previously published here.